In 2006, the Changing Places – changing lives campaign was launched by the Changing Places Consortium to raise public awareness for the need for specialist toilet and changing facilities. The aim: to provide safe, clean, comfortable changing facilities for personal hygiene and care, for people with profound and multiple learning and physical disabilities, their carers, assistants and families. Building on detailed design guidance in the British Standards BS 8300 Code of Practice for the design of buildings to meet the needs of disabled people, supplemented with good practice and advice from the Changing Places Consortium, Taylor Dolman would like to introduce Changing Concepts in association with Guldmann and Ropox. The lack of suitable changing facilities results in limiting the range of activities for some less able or elderly people. 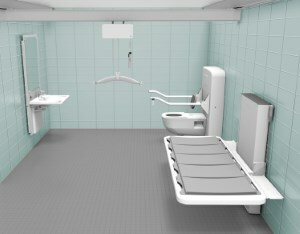 A well designed and built changing place or hygiene room can vastly improve the quality of life for many people. Together we are working toward Changing Public Concepts about hygiene provision in any and every kind of facility.